Ivor ERP’s point of sale empowers you to manage all clients and stock inventory in 1 system and with no synchronisation time delays. Everything you sell in your store will immediately reflect on your e-commerce website and Trade Me store. This isn’t enough – Ivor ERP also manages product variants in a very advanced way. Making sure that the system deducts the correct stock inventory as it is sold and ensuring that your e-commerce website keeps the best customer shopping experience. All thanks to my experience while I ran my 2 Trade Me stores between 2007 to 2011, I sold women lingerie products online at that time and later I opened a physical store in Henderson, Auckland. I could hardly find a right system for myself at that time hence it led to the development of my own software to manage all these hard work. Always overselling products to a customer on your website or Trade Me store because you realize the e-commerce order too late and oversold it to another walk-in customer by mistake? With my system, you will no longer experience this issue because all stock inventory is controlled centrally in one system, enabling a product for sale as stock inventory is sufficient and disabling a product for sale when it is sold out across all other channels. The point of sale system may also be set up to disallow selling the product when it is already sold out on your website or Trade Me store. Any product sold out in your retail shop, it can be immediately removed from selling on your website and the Trade Me listing attached to this product will be updated automatically to another product in the prepared listing pool. Headache of having multiple systems to manage customers in store, on your website and from Trade Me? With my system, it will make your life a lot easier by having all orders and customers come to one system, for you to review customer order history, process orders and refunds and know your sales figures exactly. Nevertheless, it supports multiple currencies, customer group pricing and even multiple stores. It is simply a feature-riched system. You are reading it right. Ivor ERP point of sale system is lifetime free to merchants who sell 100 products or less, with 1000 account customers limit. It is something that we build to make running a retailer business easier to get started. A free product showcase website is included, too! 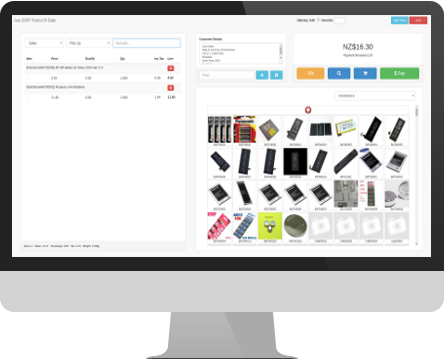 Well, not only you get the point of sale system free but also you are able to build a website with our nice website templates and this website which you built will showcase all the products at the same as you enter stock inventory information for your point of sale system. At any later stage, if you wish to convert the system to sell online or sell on the market place like trademe.co.nz then you don’t have to worry about data migration problems.